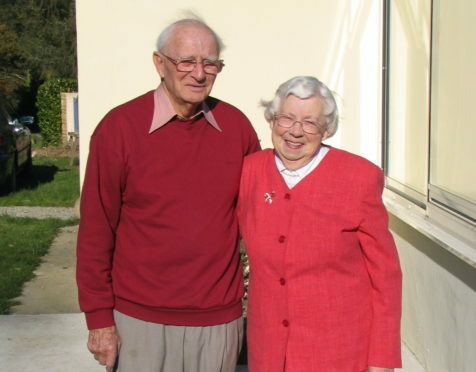 Noel and Margaret Dawson at home in Brittany on their 60th wedding anniversary in 2005, cropped. Margaret and Noel Dawson’s achievement is even being recognised by their local mayor who has offered to throw them a massive party. The couple, who now live in France, met during the Second World War and have stuck beside each other ever since. Mrs Dawson was born on September 14, 1918 in Rose Street, Aberdeen, and lived with an adoptive mother then an aunt before moving to Keith at eight years old. She then left for Edinburgh at 11 and did not return until 1939 when she joined the Women’s Auxiliary Air Force (WAAF). Couple Noel and Margaret Dawson, who will celebrate their 100th birthdays just one day apart. Mrs Dawson swiftly moved up the ranks, ending up as a flight sergeant at the Cocklaw radar station near Peterhead. It was there she met her husband-to-be. Noel Dawson was born just one day before his future wife, in Newcastle on September 13. When he was three months old his family moved to Peterhead and his father became manager of Richard Irvin and Sons ship chandlers. Mr Dawson joined the RAF in 1936 and spent five years stationed in Egypt becoming coming back in 1942. It was not long after that the pair met during a chance encounter in the sergeants’ mess hall and they quickly hit it off. 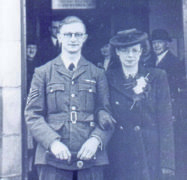 After marrying at St Rufus Church, Keith, in November 1945, the pair went through a number of large life changes in rapid succession. Mr Dawson was posted to Mumbai, India with his new bride following suit. Two years later their eldest son Colin was born, and a year after that they headed back to Keith. In 1950 the couple moved to Northumberland and had another son, Robin, in 1952. More than six decades later, the pair are still incredibly close and now live in Brittany. She added: “We both like a lot of the same things, like camping, caravanning and going around the countryside. “But we also have differences, and I think you need a bit of both. Mrs Dawson revealed that, at first, she was reluctant to celebrate her big day. “I wasn’t sure for a while but now a lot of people are interested in the two of us. The couple’s youngest son Robin, now 66, said: “The 13th and 14th are Thursday and Friday so we’re going to have a big family gathering on Saturday. “We have relatives coming from the UK and the local mayor is having a do as well.